The following post comes from a guest contributor in Israel, observing gardening and farming in times and places of conflict. Please feel free to post comments – this is a provocative and intriguing piece, and we welcome dialogue. The soldiers shuffle from side to side, trying to block our path. But there are too many of us. We walk through them like some sort of surreal slow motion charge. It’s a great chance to take photos, actually. Normally people with guns hate it when you take their picture. I guess they are trying to hide themselves. But when they are busy like this you can snap away as much as you want. The farmers running this protest know that international attention is key to the situation; Israel depends heavily on international support and public opinion. That’s why the farmers have invited so many international visitors to take pictures and video. I’m in a small town to the south of Bethlehem, Palestine. It’s called Ma’asara. 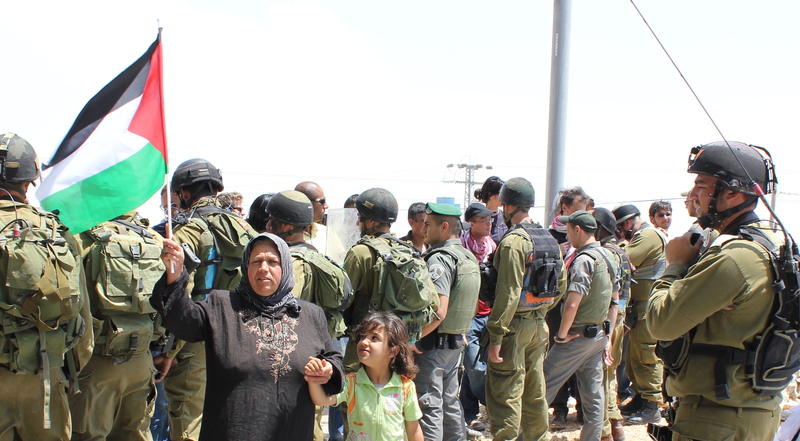 The people in this town used to be farmers, but much of their land was taken and colonized by the Israeli government. Each week the farmers attempt to walk to their farm land. They have been doing this since October 2006; about 280 times so far. They have every intention of continuing until they are again able to farm their own land. The town is caught up in Israel’s plan to surround and isolate Bethlehem, forcing the city to be landless and therefore purchase food and other essentials from settlers. The French government is building an industrial area to help Bethlehem have some sort of industry besides farming. They appreciate the help from the French, but know that the situation remains unjust. The southwest to the northeast corner of Bethlehem, is already quite well blocked off with a wall. The SE is well colonized and there is a highway built for settlers encircling Bethlehem. The strategy for colonizing the area is to create settlements on top of hills, then gradually join these settlements. First, they are joined with “outposts” that even the Israeli military technically acknowledges as illegal, but doesn’t stop. Once these outposts are established, more buildings are added. Infrastructure installation such as water delivery and electricity is mostly already complete. It seems clear that soon Bethlehem will be surrounded. The isolation process of Palestinians here has worked in a stepwise process. First, farmers are allowed to enter the settled territory and access their land. The next year, permission is required and everyone is granted permission after an hour or two’s wait. On the third year, permission is rarely granted. On the fourth year, farmers were not allowed to access their land. As Gandhi says, nonviolent protests encourage participation by everyone, greatly increasing it’s democratic potential. As the people of Bethlehem become almost exclusively dependent on foreign aid for survival, their culture begins to change. Generally and honest and hard working people, the people of this area are unable to work at their normal industry. They are dependent on handouts, with the usual cultural destruction that accompanies lack of genuine work. The people of Al Ma’sara have been watching this happen for years. Today they spoke to the soldiers and asked them not to act like machines. The soldiers were reminded that “just following orders” is not a good excuse any more, after the Nuremberg trials. That the settlements are widely accepted as illegal under international law. They clearly violate the Fourth Geneva Convention. Israelis I know are an intelligent and well educated people, and I’m sure this fact isn’t lost on all many of the soldiers. They don’t join the military voluntarily, after all, but are forced to join for three long years. Walking through grapes toward the stolen land. At this time of year the grape leaves are being harvested. Meanwhile, back in Bethlehem people are taking urban farming more seriously. I went for an interview with Kamara, an organization working to grow food in Deheishe Refugee Camp. The gardening habit is well ingrained in people here, and there are some lovely gardens inside the refugee camp. I see olives, pomegranates, loquat, figs, mint and nasturtium at just about every turn. But the space, of course, is still insufficient. That’s why Dr. Yasser Al-Haj is excited about growing food on rooftops. He is setting up shade houses on roofs all over the camp, with a goal of 200 structures in the near future. The structure doubles as a greenhouse during the cold winter, replacing the 50% shade net with clear plastic. The structures, costing about 700 dollars each, are composed of a steel frame and PVC pipes filled with coconut husk fiber as a growing medium. 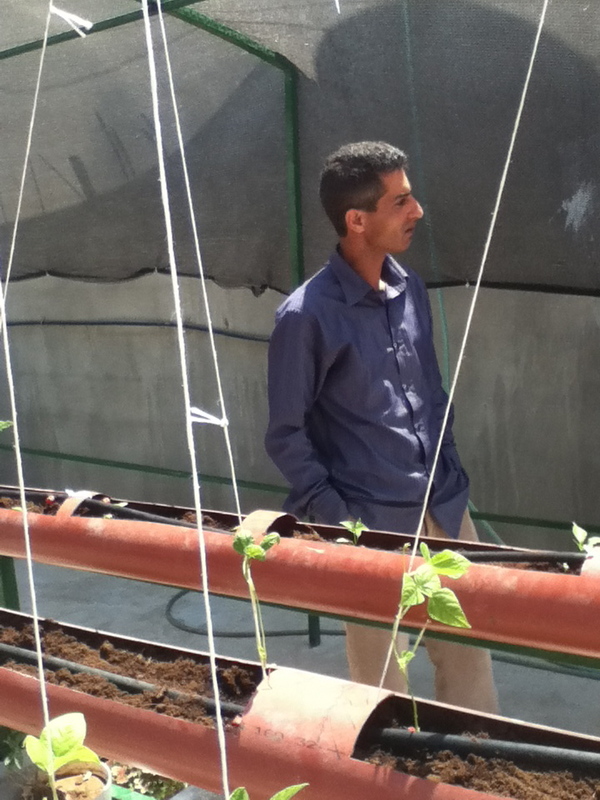 Yasser intends to feed the plants with liquid compost through the drip irrigation. The steel frame has convenient hooks for setting up extensive supports for the plants to climb on. The system is in it’s first trial year, and I can see small zucchini, pumpkin, tomatoes, eggplant, beans, strawberries, mint and peppers taking root. Dr. Yasser Al-Haj in one of the shade houses. This entry was posted in Blog, Guest Contributor, Political Peace, Social Peace and tagged Bethlehem, farming, gardening, Israel, rooftop shade houses, self-sufficiency by hannahrenglich. Bookmark the permalink.